Anne (O'Rourke) Callery, 79, of Danbury, CT and Jupiter, FL, passed away at home on Friday January 9, 2015 after a 10 year courageous battle with Alzheimer's disease. She was a loving and devoted wife of 54 years to her husband, James D. Callery. Anne was born on January 3, 1936 in Brooklyn NY, to the late William and Mary (Connolly) O' Rourke. 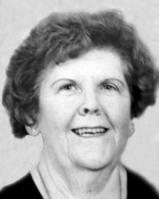 She was an administrative assistant at the First Congregational Church of Danbury later retiring from Stavely NDT Enterprises. Anne was a devoted parishioner of St. Joseph's Church in Danbury, where she volunteered for many duties in the church. She was a Eucharistic minister, member of the ladies guild and the Council of Catholic Women as well as a "Currency Engineer". Anne Enjoyed Cruising the world with her husband as well as numerous family vacations. Her Grandchildren were her pride and joy. Besides her husband she is survived by her son and daughter in law, James and Cynthia Callery of Sandy Hook, CT. Her precious and beloved grandchildren: Jennifer, Brendan and Abigail Callery. Devoted niece and "Sister": Eileen Connolly. Many nieces and nephews also survive. Besides her parents, Anne was predeceased by her sisters, Mary Mucha, Dorothy Meyer and brother William O'Rourke. The family wishes to thank her amazing caregiver Graciela Cordova who lovingly cared for "GeeGee" over the past 5 years. A Mass of Christian Burial will be celebrated on Friday, January 16, 2015 at 10:00am at St. Joseph Church, 8 Robinson Ave. , Danbury, CT. Burial to follow at the State Veterans Cemetery, 317 Bow Ln., Middletown, CT.